URBANA, Ill. – For many Americans, highly processed foods are on the menu for breakfast, lunch, and dinner. Even when the raw materials – grains, for example – are high in vitamins and health-promoting phenolic compounds, processing can rob the final product of these nutrients. In a set of recent studies, University of Illinois scientists reveal what happens to cancer-fighting phenolic acids in corn when it is processed into cornflakes. “What we found was not particularly good news, but it was interesting. Regardless of the concentration in the grain at the beginning, the dry-milling process removes the majority of phenolics,” says Carrie Butts-Wilmsmeyer, lead author of the two studies and research assistant professor in the Department of Crop Sciences at U of I. “We did see an increase in soluble phenolics, but it was so small, you could have gotten the same benefit from going to the refrigerator and eating a few blueberries,” Butts-Wilmsmeyer says. Despite the less-than-ideal outcome, the studies represent important steps forward for food science researchers and the food processing industry. First, the lab-bench-size process developed and demonstrated by the researchers in JoVE Video Journal allows testing of small batches of experimental corn lines. 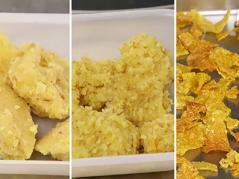 “Before this project, the only published study on cornflake processing used a sample size of 45 kilograms. We worked with ag engineers to get it down to 100 grams, literally a 450th of the size,” Butts-Wilmsmeyer says. “Since we now have the process miniaturized and can control everything in the lab, we can also start figuring out how we can change the process to recover more of these compounds in the end product,” says Martin Bohn, co-author of the studies and associate professor in the Department of Crop Sciences at U of I. Although the phenolics didn’t make it to the final product, they weren’t lost entirely. Butts-Wilmsmeyer says fortifying processed foods with health-promoting, cancer-fighting phenolics could benefit people without easy access to fresh foods, such as Americans living in food deserts. “These itty-bitty compounds are tied to everything,” she says. The article, “High-throughput, microscale protocol for the analysis of processing parameters and nutritional qualities in maize (Zea mays L.),” is published in JoVE Video Journal [DOI: 10.3791/57809]. Authors include Carrie Butts-Wilmsmeyer, Nicole Yana, Gurshagan Kandhola, Kent Rausch, Rita Mumm, and Martin Bohn, all from the College of Agricultural, Consumer and Environmental Sciences at the University of Illinois. The article, “Changes in phenolic acid content in maize during food produce processing,” is published in the Journal of Agricultural and Food Chemistry [DOI: 10.1021/acs.jafc.7b05242]. Authors include Carrie Butts-Wilmsmeyer, Rita Mumm, Kent Rausch, Gurshagan Kandhola, Nicole Yana, Mary Happ, Alexandra Ostezan, Matthew Wasmund, and Martin Bohn.